I’m sixty-three years old and believe me when I say that throughout my lifetime I have tried just about every diet out there. I guess I have been obsessed about my weight forever…well, at least since menopause made it almost impossible to lose a pound! I’ve always considered myself part of the “new age” crowd ever since the '60s. So The Inner Peace Diet piqued my interest. 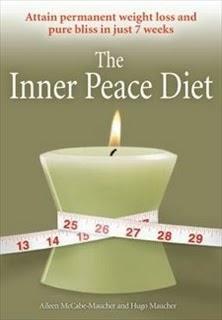 I soon discovered that The Inner Peace Diet is not your normal diet book. Written by a professional chef and a registered nurse who is also a social worker, the book is centered on the chakra system, and is written to bring your energy and life in balance. If you aren’t an expert on chakras, there is no need to worry. This book will explain everything that you need to know to take part in the seven-week weight loss plan. Each week of the diet centers around one of the seven chakras. The meals are easy to make and are not your ordinary fare: baked eggs Florentine casserole, pear yogurt bread, teriyaki fettuccine with watercress, and even healthy banana s’mores. So, I suggest that you read The Inner Peace Diet if you are looking for a diet that considers not only your body, but also your mind and your spirit. You can lose weight and get your life in balance! This sounds intriguing. I'll have to check it out!